Twitter Chat: What do you know about antibiotics? 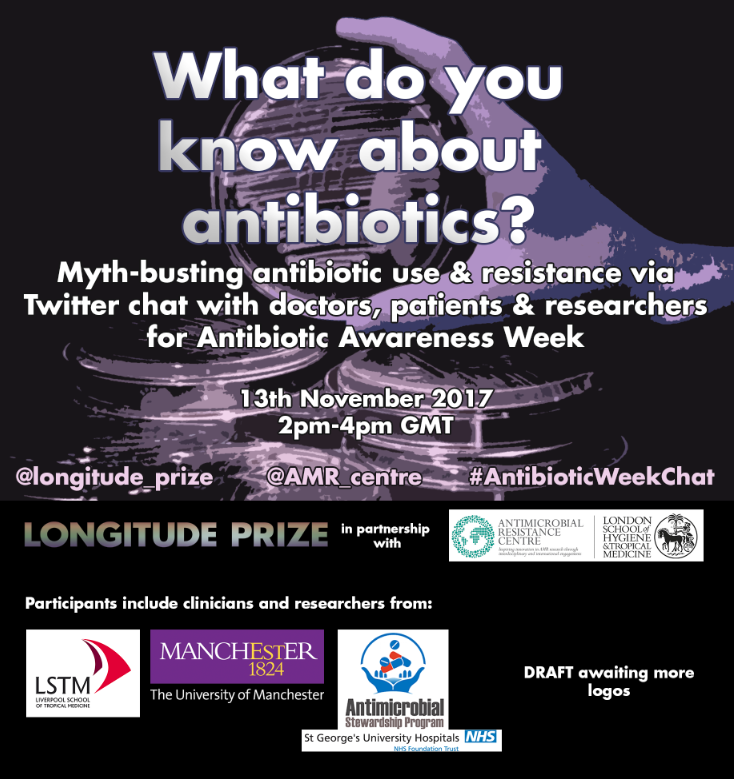 Join Longitude Prize, several organisations and inviduals for a Twitter Chat with expert panellist to myth bust common misconceptions about antibiotics and resistance. Theme: Why should we care about antibiotic use? What information can we trust and what should I be asking my GP? In this Twitter Chat, several organisations and individuals will be in conversation with YOU, mythbusting common misconceptions about using antibiotics and addressing how to educate yourself and others about the growing problem of antibiotic resistance. Join us for this opportunity to learn from scientists, researchers, clinicians and patients. 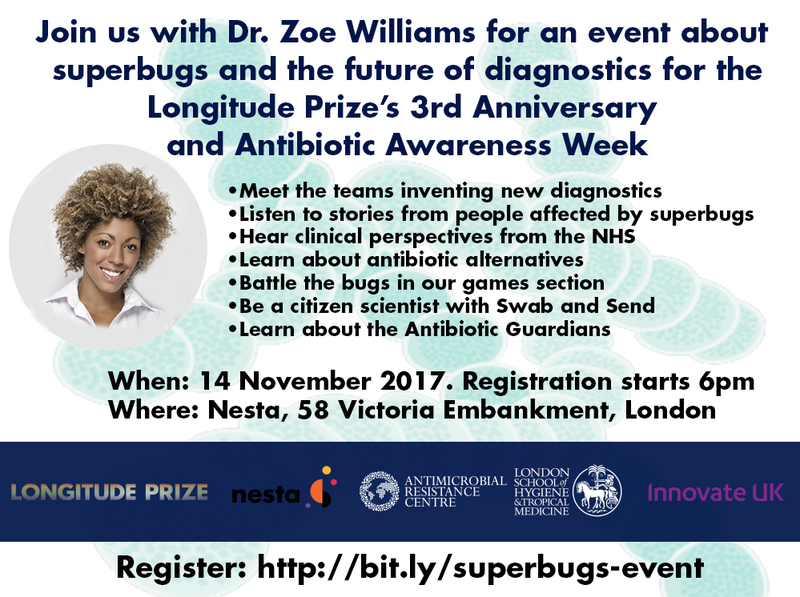 The Longitude Prize and the AMR Centre at the London School of Hygiene and Tropical Medicine invite you to celebrate the third anniversary of the five year prize at our ‘Superbugs and the Role of Diagnostics’ event on Tuesday 14th November, during World Antibiotic Awareness Week. Join us for a night with Dr. Zoe Williams, resident doctor on This Morning and a presenter on BBC Two’s Trust Me I’m a Doctor, to explore the lives of those affected by superbugs, the clinicians trying to help them and the teams coming up with solutions to reduce antibiotic resistance. To secure your place, please register below. Registration and the interactive showcase opens at 18:00 with the event starting promptly at 18:45. The event will finish at 20:00, followed by networking drinks and canapés until 21:00. For any queries or for further information please don’t hesitate to contact us at events@nesta.org.uk.